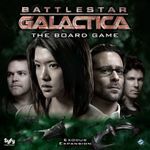 Now that the Daybreak expansion has been released, we’re really unlikely to see any more new official material for BSG. But for many reasons -- including the fact that my base-set cards are looking a little yellower than my brand new crisp Daybreak cards -- I’d be happy to re-buy everything if they came out with a "Big Box" version including all the expansions. Here is the beginning of a wishlist for a Big Box version, if Fantasy Flight Games ever deemed it viable. Feel free to add your own wishes! You can see that I’ve been working on my own informal one, and there have of course been a few others posted here with foci on different aspects, but an official combined rules doc would be ideal,including all the optional components and instructions on how to scale all the way down or up in an easy-to-search format. We all know how well-known FFG is for their rulebook formatting, but we can dream, can't we? To avoid exceptions in the rulebook, they could tighten up the wording on a few things. 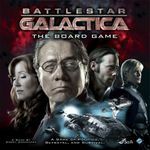 - Instead of saying "Damage Galactica" and then having a special rule that you can choose Pegasus instead, just change the term to "Damage a Battlestar". - Change all of the references to "once per game" on character sheets and The Farm Super Crisis to "Miracle Ability". - Include the wording about how Reckless checks are affected directly on the "Restore Order" card. Include options to scale all the way down to "base game only" status*, and all the way up, bit by bit. Include all of the components necessary to scale back, including the maligned Sympathizer cards, Cylon Leader Agendas, and Pegasus Treachery Cards, etc. (Unfortunately, Mutiny Cards are too strongly tied to the replacement mechanics, so if you choose not to use Daybreak you have to use the older stuff). And instead of overlays, you’ll just need multiple versions of separate double-sided boards for Colonial One and the Cylon Locations, making the main board smaller and easier to manage. Put a special mark on cards that include references to Treachery, Cylon Attack Crises, "CAG Chooses", Mutiny, etc, so that players can easily spot them when sorting out cards to scale down. Instead of the cardboard standups, minis representing the characters would be nice. My "Ticket to Ride" experience improved significantly with the large-sized train cards. Large skill/destination cards in BSG would be great. Easier to hold, easier to read, easier to shuffle, easier to sleeve. There are now plastic minis of all the other Cylon components. Why not these? In the ever-growing Crisis Deck, there are only 5 cards with the "Consequence" mechanic. Just enough to have to explain it, but not enough to worry about it. I was actually surprised not to see Consequences on any Daybreak crises. Go back and insert some Consequences onto more Crises. What could it hurt?